Ron Cook, age 79, of Mesa, passed away at home on Saturday, August 8, 2015 after a challenging fight with cancer. His funeral service will be held at 10:00am, preceded by a visitation at 9:00am, on Thursday, August 13 at the Alta Mesa LDS Stake Center, 5350 East McLellan in Mesa. The viewing will be held at 7:00pm to 9:00pm on Wednesday, August 12 at Bunker’s Garden Chapel, 33 North Centennial Way in Mesa. Ron was born in American Fork, Utah to Clarence and Myrl Thornton Cook. He spent most of his childhood years in Boise, Idaho until his family moved to Mesa, Arizona when he was in high school. After graduating from BYU and teaching school for a few years in Salt Lake City, he and his wife Marilyn moved to Mesa where they have lived ever since. Ron is survived by his eternal companion, Marilyn Freeman; sons Bryce (Sara), Darren (Ruth) and Lane (Kathryn); and daughters, Shauna Wade (Steve) and Kami Christensen (Lars). He and Marilyn have 23 grandchildren. He is also survived by brothers Gene (Janelle) and Harvey (Anne) and sister Carol Hiatt (Chuck). His parents Clarence and Myrl Cook preceded him in death. Ron graduated from Mesa High then attended Brigham Young University and received his bachelor’s degree in speech and journalism. He also did graduate work at the University of Utah and Arizona State University. He taught school at Lincoln Junior High in Salt Lake City and Carson Junior High in Mesa. While a student at BYU and later as a teacher, he also worked as a radio announcer, DJ and newsman for KALL in Salt Lake City, KOVO and KIXX in Provo, KALF in Mesa and KPHO in Phoenix. After teaching for a few years, he followed the lead of his father by entering the insurance industry. He founded Cook Insurance Inc, a full-service independent insurance agency, in 1977, where he worked until retiring in 2003. Ron was well known for his voice work. He had various roles in the Mesa LDS Temple Easter Pageant as narrator, voice character and actor going back to its start in 1954 and can still be heard in some parts today. For a time he was the voice of “MAX the Talking Car” for the Mesa Police Department and also did narration for the Mesa Fire Department. He acted the part of Patrick Henry on stage for Mesa Community College and for LDS Church celebrations of America’s bicentennial in 1976. He emceed many church and community events in Mesa, began a neighborhood block watch, was a republican precinct committeeman, a volunteer at the worldwide G8 Summit of nations held in 2004 at Sea Island, Georgia, and recently enjoyed performing with RadiOzona productions of old-time radio shows before live audiences in the East Valley. Active all his life in the Church of Jesus Christ of Latter-day Saints, Ron served a mission as a young man in the North-Central States mission. Later in life, he and Marilyn served three missions of voluntary missionary service: for Church Public Affairs in the South-East North American Area, on Temple Square in Salt Lake City, and as managers of the Mesa LDS Employment Resources Center. 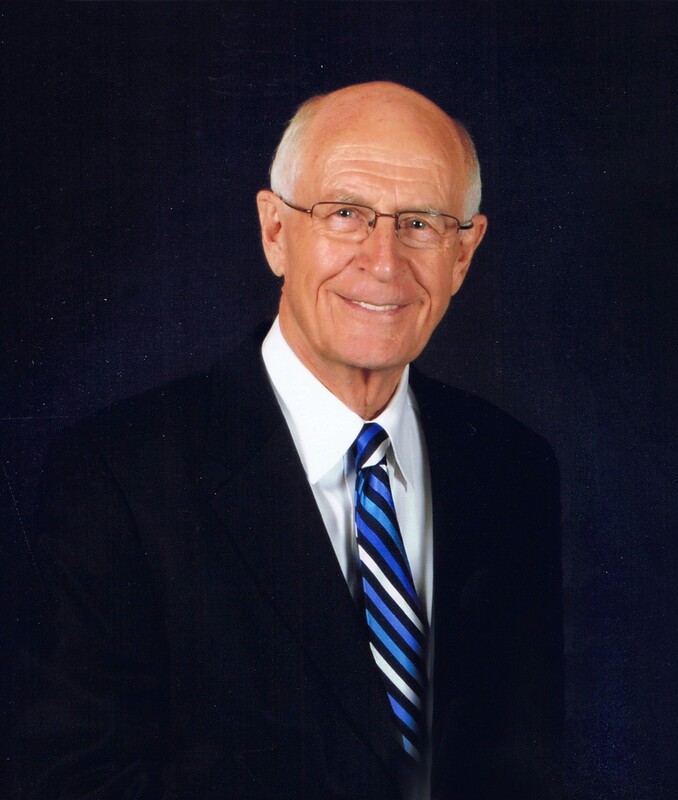 Ron has served in bishoprics, high councils, as stake mission president, high priest group leader, young mens’ president and as a faithful home teacher all his life. Of all his accomplishments, the legacy for which Ron most wanted to be remembered was of the wonderful family he and Marilyn raised together. He passed to his children talents, abilities, the ability to do hard work, organizing, being a self-starter, dependability, and liking people – also smiling, good humor, and success in business and community. He played the piano, enjoyed writing, and was an avid sports fan of all Arizona professional sports teams, ASU and BYU. In lieu of flowers, Ron would be honored for donations to be made to the LDS Church Perpetual Education Fund or its humanitarian causes. Arrangements by Bunker’s Garden Chapel. Ron Cook was a member of our Bishopric in the 28th Ward and he was always smiling, not contentious and he served very well and he was certainly not power hungry. That was many years ago, but we still remember him and the things he said and did. We will not be able to come to the visitation or funeral, but please know that we are hoping and praying for your family to be comforted. We also have lost a father to the ravages of cancer and we know how difficult this can be. Dear Bryce and Sara-Please accept my sympathies for the difficult experience you and your family are going through with the passing of your father. You and your family are in my thoughts and prayers.